I can't vouch for how much money Green Metropolis donate towards their declared aim of saving the planet but I've been using them for the last couple of years to sell on books I no longer want and using the credit to buy things I do want. This week I bought "I Saw Two Englands" by H.V. Morton, the Michael Palin of his day, for £3.50. It's got a tattered dust jacket but so would you if you'd been given by Kathleen to Mabel at Christmas 1946. 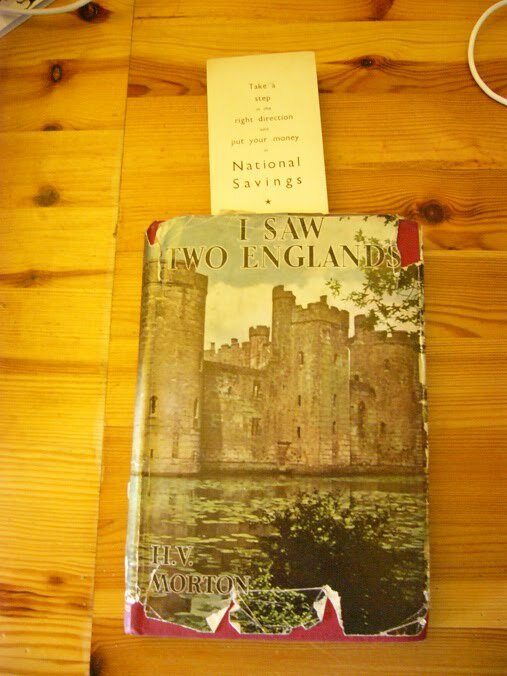 The actual copy's in very good condition - and, what's more, it comes with a bookmark extolling the virtues of National Savings. I can't tell you how much pleasure I get from things like this dropping through the letterbox. I've been selling a load of my old books on GreenMetropolis recently. A few weeks back I sent a copy of The Black Swan to a Mr David Hepworth. At the time I thought "I wonder if it's THAT David Hepworth". Then I (coincidentally) started reading your blog. Then I saw this post. Hope you enjoyed the book? I can't say I did, unfortunately. I picked up a lot of HV Morton books from a derelict church / bookshop in Dartmouth a few years ago. I do love them dearly and keep his London columns within easy reach so that I can dip into them. Many of these worn volumes contain dedications written to their former owners. They were gifts from friends or spouses:- There's a lot of humanity Morton's writing - the way that he quietly observes people. On top of that you have sense of these books being owned and maybe loved by other people before you came along and pulled them out of the fire for a few quid. You don't get that sense of continuity or shared experience with an ebook. Thanks very much for that. I live in the sticks where we don't have a bookshop that pays for books, so often end up giving them to charity shops.